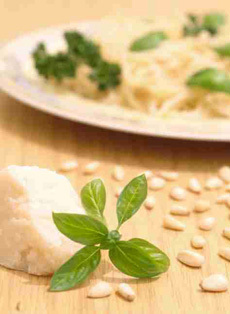 It all starts with basil, parmesan, pine nuts and olive oil. ALISSA DICKER SCHRIEBER is a freelance writer and cooking teacher who resides in New York City. Page 4: Divine Pasta Co. This is Page 4 of a 10-page review. Click on the black links below to visit other pages. This company uses local, California-grown ingredients wherever possible, working in small batches and pouring and labeling every container by hand. We devoured the Roasted Garlic Pesto, a rich, golden paste flecked with herbs and small walnut chunks—a garlic lover’s dream. It can really be used anywhere—as a spread, in easy garlic mashed potatoes, on meats and fish, in sauces and dressings—anytime you’re in the mood for some sweet garlicky goodness. The Basil Pesto is a gorgeous shade of pale green, exceptionally creamy, and subtly flavored. It was the cheesiest of our picks, so it literally melts in your mouth. The Arugula Pesto was similar to the basil in texture, and was also quite delicate—just a bit more peppery. Either makes a perfect accompaniment to pasta, of course, but we love adding a drop to our lemon and olive oil vinaigrette. Another standout (and our editorial director’s personal favorite) was the smoky Chipotle Pesto, a thick, brick red sauce with some serious kick. The folks at Divine suggest combining equal parts Chipotle Pesto and orange juice as a marinade for pork tenderloin. We mixed the pesto with mayonnaise and made a spectacular southwest chicken salad. The Sun-Dried Tomato Pesto was nice and light, unusual for this type of pesto, which tends to be rather pasty. It’s great on pizza, and even better when combined with goat cheese as a dip. Divine also makes Cilantro, Shiitake and Olive pestos. 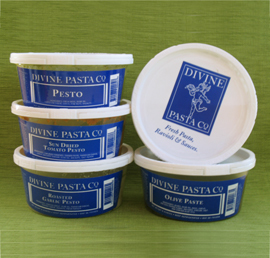 Visit DivinePasta.com for more information and to purchase online.